Hands-on with Bethesda's online-only romp through the nuclear wasteland. I really wanted to find the Mothman. Apparently he resides along the Greenbrier River, in the lush, post-apocalyptic forests of West Virginia. Pull up the map in Fallout 76 and a friendly icon proclaiming "Mothman Museum" sits along the river's east bank, just below Vault 76 and above something called The Giant Teapot. Fallout 76's world is four times larger than Fallout 4's, easily making it the biggest game in the series, and the Mothman is just one pit stop among hundreds of attractions littered across the freshly irradiated land. I spent three hours traversing a small sliver of the Fallout 76 map alongside three other players, one of whom was a spokesperson for Bethesda, the studio behind the Fallout series. Instead of hunting for a mythical creature in the Appalachian backwoods, the four of us spent time murdering skinless mutants and collecting society's leftover scraps to transform into weapons, tools and shelter. I followed the prompts, completed some missions and stuck by my team. I had a good time. But now, the Mothman is haunting me. I wish I'd broken away from the group and played my own game, investigating the weirdest parts of the map rather than sticking to the main drag. I wish I'd played Fallout 76 like I've played previous Fallout games -- solo. I represent Fallout 76 design director Emil Pagliarulo's nightmare scenario. "I think a lot about the players who want Fallout 5, and this isn't Fallout 5," Pagliarulo said in a roundtable interview after the hands-on session. "Are they gonna be happy? Are they still gonna enjoy playing this game even though it's like -- I actually think we've pushed a lot closer to a much more Fallout 5-ish, single-player-friendly game, but it's still not. ...I worry about that." Fallout 76 is an online-only game. This is a departure for the series -- previous Fallout entries have been story-driven, single-player RPGs without multiplayer modes. Fallout 76, meanwhile, is packed with real-person players and it strongly encourages team-based adventuring. In fact, every human character in the game is another actual player, while the robots, mutants and creepy creatures are computer-generated NPCs. These NPCs are key to Fallout 76's narrative. While the game is designed to be a persistent, living universe where players' actions shape the experience, Pagliarulo promises it still has an emotional core. There's a central storyline that -- along with other, smaller anecdotes -- unfolds through interactions with NPCs, computer terminals, notes and holotapes (audio diaries). The main narrative focuses on the Overseer, who acted as the matriarch of Vault 76, while the side tales explore the lives of survivors just 25 years after a nuclear apocalypse ravaged Earth. The Overseer's narrative was added to Fallout 76 when developers realized the game was missing something -- the dramatic hook that was so critical in previous Fallout games. "We realized at some point that maybe that wasn't there, so that we really needed the Overseer and her arc," Pagliarulo said. "She was basically the matron of Vault 76, the mother figure, and she's going out there and exploring, and she also grew up in the area. You get to listen to her story and hear how the change of the world affects her personally." "The game doesn't pause, so you'll have to hoard your holotapes." Players won't be spoon-fed the Overseer's journey in Fallout 76. In fact, unless you make an active effort to collect and listen to holotapes, it'll be easy to miss a lot of the story beats. "I like to absorb all of it, follow the main quest and listen to the Overseer's holotapes, and then get the little stories here and there of the different people," Pagliarulo said. "The game doesn't pause, so you'll have to hoard your holotapes and go into a dark corner or your camp, and make sure you're safe and catch up on things. There are stories, little and big, all over the place." Main quests ensure players are able to follow the general narrative gist, but emphasis this time around is on player-to-player interaction, survival and society-building. Pagliarulo insisted the story is still a priority, however. "It's not less important; it's just told differently," he said. A lot of things haven't changed in Fallout 76. The SPECIAL stat system is back, allowing players to customize their characters by leveling up across seven categories: Strength, Perception, Endurance, Charisma, Intelligence, Agility and Luck. 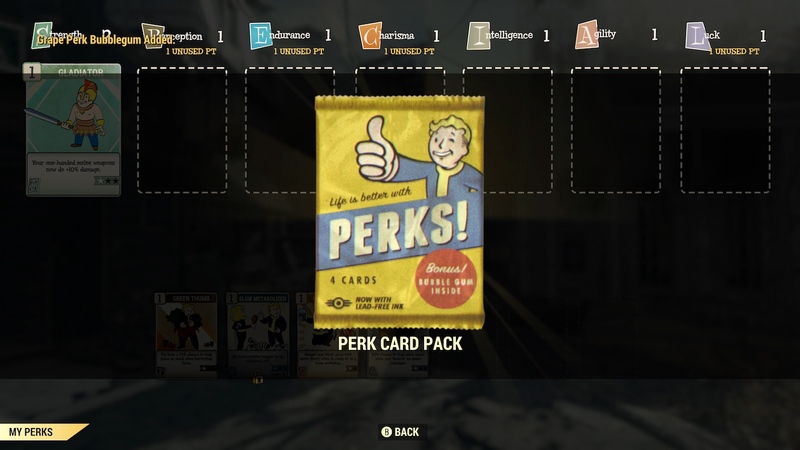 Perks are back, too, but this time around they come in the form of card packs that enable players to augment their chosen SPECIAL stats endlessly throughout the game. The packs appear at levels four, six, eight and 10, and then once every five levels from there. SPECIAL abilities max out at level 50, but Perk Packs keep on coming, making the game's actual level cap hit triple digits, according to developers. 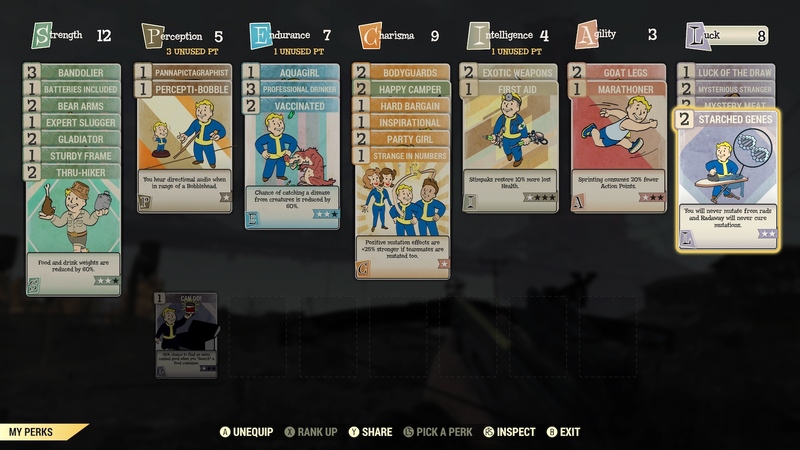 The Fallout targeting system, VATS, makes a return in Fallout 76, but now it tracks enemies in real-time, rather than thrusting players into a slowed-down bullet-time. Crafting and base building are major aspects in the new game -- in fact, developers estimate there are 70,000 mods and recipes to unlock. This makes sense, too, considering Fallout 76's emphasis on player-driven, post-endgame play in a living world. Looting is still a core mechanic, and the wild woods of West Virginia are filled with toolboxes, refrigerators, trash cans, crates and cash registers to dig through, plus all manner of abandoned buildings to search. Players are able to carry everything from bobby pins and empty jars to fully formed weapons, and then trade in these items for cash or crafting purposes. Not long into my exploration of the world outside of Vault 76, my Pip-Boy was packed with random items and my eyes constantly skittered across every available in-game surface, looking for new goodies to collect. 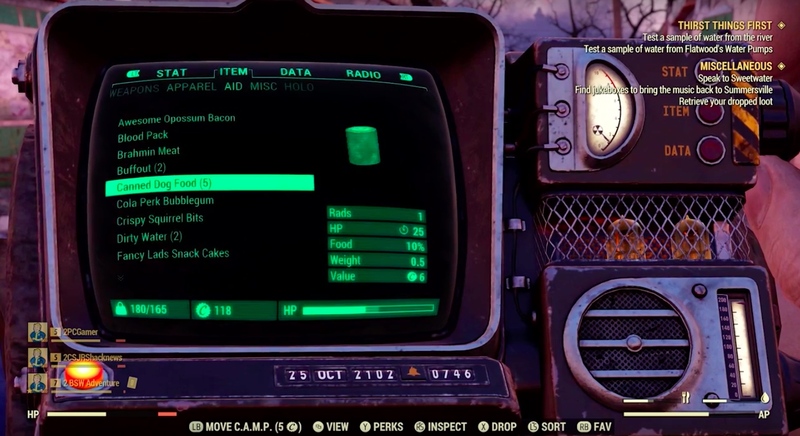 In the Pip-Boy, you're able to add a heart to items and weapons, and then access them on the fly by pressing up on the D-pad, which pops up a wheel with 12 of your favorite things. I used the heart wheel exclusively for weapons, of which I had plenty after just an hour of scavenging. I needed them, too. Even traveling with a group of other players, I died a handful of times in hectic battles with greasy mutants, giant bugs and massive, flying, over-powered Scorchbeasts. Everyone on my team died a few times, at least, but it wasn't ever a big deal. Dying isn't a major punitive blow in Fallout 76, especially if you're playing as a group. You can set up a base and re-enter the game from that point, or a teammate can revive you with a Stimpak. Even if you do drift into the great beyond, upon respawn you can fast travel to anyone in the group. Or you can say screw it and go hunt the Mothman on your own. One of my teammates actually spotted the Mothman at one point, briefly, drifting among the trees. As he casually told the rest of the group what he'd seen, a nearby developer stopped in surprise. "Wait, you saw him? He's really hard to find. Wow." Meanwhile, my character was miles away, following our team leader across a sunny hillside packed with angry mutants. Disappointment pricked my senses, but I was quickly distracted by a fresh horde and a smattering of mission updates flashing across the screen. I believe my imagination wrapped itself around the mystery of the Mothman because years of Fallout games have primed me to expect a heart-wrenching story about humanity in a nuclear wasteland, and when I couldn't find a core narrative in Fallout 76, I made one up. There were missions and events and PVP battles galore, but Fallout 76 is simply not a story-driven game. Does each team have a common goal, or is it essentially a group of individuals playing four separate storylines at the same time? The stories and quests are individual to each person playing the game, and that includes the main quest –- following the Overseer's journey as she ventures out into Appalachia to secure the missile silos. So when you're in a team, the goal is to help each other in any way you can. "Solo but together" might be a good way to look at. If you play the game with the same group from the beginning, you'll be experiencing these stories at relatively the same time. Events are an exception -– they can be solo'd, but are intended to be done as a group –- and that includes your own team. Are there any aspects of the game that require multiple people or a team? The entire game can be solo'd –- and that's actually how I prefer to play. That said, certain things are easier if you work in a group. Definitely. Especially the end-game content, where you're trying to collect and decipher nuclear codes. So we encourage joining up, but we don't require it. What I've generally found is that even if you're solo'ing the game, the fact that there are other players in the world with you means you always have help within arm's reach if you need it. For example, recently I was solo'ing a pretty early event that has you killing waves of Scorched. It was difficult, but I was doing it. But I was expending a lot of ammo and Stimpaks in the process. Out of nowhere, another designer who was playing wandered into the event and started helping me out. It was a huge relief. So those moments are common -– a little assist when you need it the most. How does progression work when every player on the team is on a different mission? We track the progression separately on the onscreen UI. If a quest has a star next to it, that's the one the team leader is currently doing. If you have the same quest, then your objectives will show up too. If the team leader is on a different objective than you, their objective will have a star next to it –- yours won't. So a lot of the fun –- and we saw this quite a few times with the Greenbrier groups -– is communicating with your team and letting them know where stuff is. "Hey, this chest has a star over it, your objective is over here." That type of thing. The progression system itself belies the game's new, post-endgame focus. Teaming up with other players is beneficial throughout the game, offering shared XP for completing quests and on-demand help with tricky situations, but it really makes sense once everyone has played through the main missions. 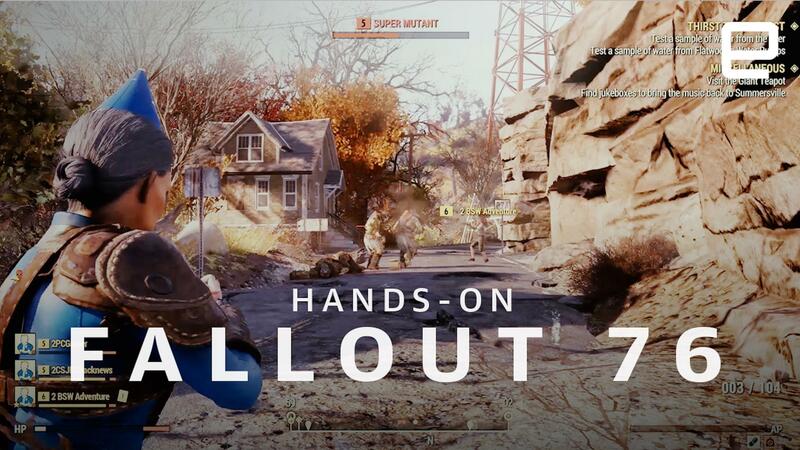 Fallout 76 is about building bases and alliances, and engaging in live events and player-dictated experiences. It's about establishing a world and letting players run around in it, unencumbered by a singular storyline. That isn't a bad thing. Fallout 76 is a new way to play around in Bethesda's post-apocalyptic universe and that'll take some getting-used-to for longtime series fans. However, for anyone who's played Fallout New Vegas five times over or re-started Fallout 4 a dozen times, Fallout 76 represents a new, innovative way to exist in that universe, in perpetuity. Fallout 76 isn't Fallout 5 -- but it does have the Mothman, and that's certainly something.